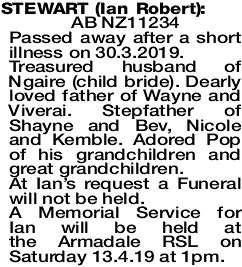 AB NZ11234 Passed away after a short illness on 30.3.2019. Treasured husband of Ngaire (child bride). Dearly loved father of Wayne and Viverai. Stepfather of Shayne and Bev, Nicole and Kemble. Adored Pop of his grandchildren and great grandchildren. At Ian's request a Funeral will not be held. 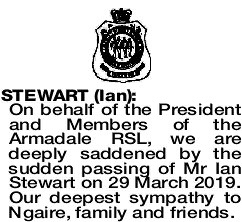 A Memorial Service for Ian will be held at the Armadale RSL on Saturday 13.4.19 at 1pm. 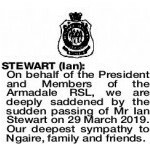 On behalf of the President and Members of the Armadale RSL, we are deeply saddened by the sudden passing of Mr Ian Stewart on 29 March 2019. Our deepest sympathy to Ngaire, family and friends.